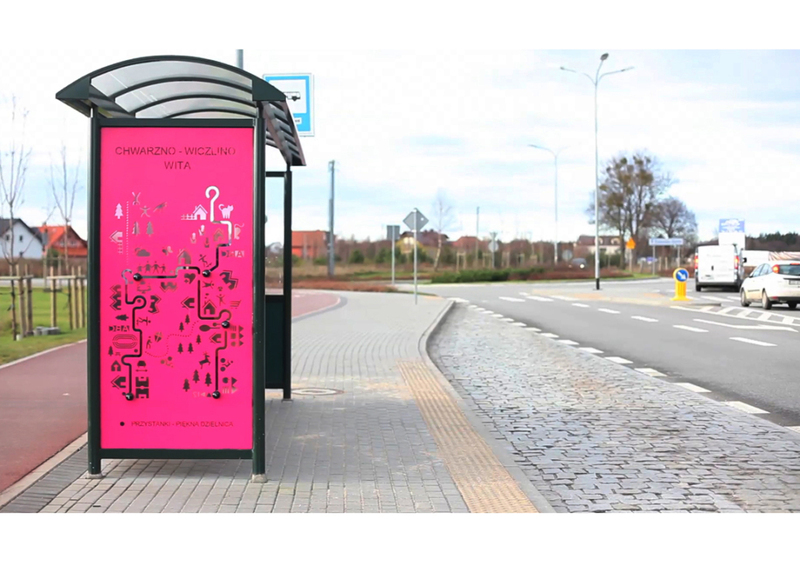 The idea of the design of the bus stops was a result of the cooperation with the District Council in the competition Piękna Dzielnica (“Beautiful District”), organised by the city of Gdynia. It was praised highly by the jury and won the subsidy of PLN 60,000. The project was run in the vast and dynamically developing district of Chwarzno-Wiczlino. Nowadays, new house estates are constructed there, with limited access to leisure spots. The lack of proper transport infrastructure generates traffic jams in rush hours. There are more and more people in the area; however, the same cannot be said about friendly places in the public space. We wished to prove that a bus can both fulfil a transportation function and become a place of social interaction encouraging a variety of creative activities. We wanted to urge the inhabitants of the district to use public transport. To make the waiting for a bus more pleasant, we placed two types of entertainment boards on the side panels of the bus shelters. The first one is a pinscreen which allows you to create your own relief in a couple of seconds. You just need to press yourself or any other shape on it. Thanks to the changing character of the installation, every single person has the opportunity to form the space around them. The other type of a board is a labyrinth map of the district, which joins the elements of play and education. The public transport lines are marked on it and you can find your bus stop there. The steering knob imitating a bus provides not only an agility challenge but also a chance of a virtual journey around the district. The aim of the project was not only to implement a new solution but also to equip it with attractive features which would make it distinguishable and recognisable. User-oriented thinking was a priority for us from the very beginning. Design became a natural way of problem solving. Our actions were preceded by discussions with the residents and the research on shaping the public transport of the district. The analyses of similar installations adopting an innovative approach to public space also proved helpful. Thanks to their involvement, the designers supported the whole project process carried out by the city officers. During the creation of the project, all the solutions were consulted with the service providers in terms of technical aspects and cost minimisation.